By popular request I have a look at some of the new Chanel Rouge Coco Flash Lip Colors ($38 each) and the new Voyage de Chanel Travel Face Palette ($70). There are some really nice colors out for a pretty soft fresh glow this season. Chanel replaced their Rouge Coco Shine with a new formula called Rouge Coco Flash. The formula seem very similar to each other, I really cannot tell the difference except in the packaging and the newer ones seem to have a slightly more hydrating feel. Rouge Coco Flash has a sheer color formula with a high glossy finish. They’re smooth and hydrating with an emollient balm-like feel. These have sheer pigment for the natural lighter shades. The deeper brighter colors will have more color payoff. I limited myself to five and ordered a few to see how I liked the formula before committing to more. These have that signature lipstick scent that some of the Chanel lipsticks have (like their Rouge Coco). It’s not overpowering or too strong. I can really only notice it when I take a hard sniff. They have a very glossy feel and lots of shine. Lasting power is not really there, but that is expected with a sheer glossy lip product. Color stayed on for around 2-3 hours without touching the lips to any drinks or snacks. Since these are comfortable I don’t mind reapplying. Up next is a look at a new face palette from Chanel. I received a press sample of the new Voyage de Chanel Travel Palette. Right now it’s exclusive to Chanel.com in the US. It has four cheek shades in a quad similar to the Coco Codes from a few years back. It’s described as having “baked powder” technology which makes it soft and fine in texture. It is a soft powder that gives a very natural effect. You can layer for more coverage. Since the colors are all close to each other without a separator swirling/mixing colors is most likely going to happen. Application is smooth and even. Finish is natural but glowy. Lasting power was very good – stayed put all day without darkening or budging. Overall some lovely classics for the spring season. The Rouge Coco Flash lipsticks have a pretty color range for a fresh easy to wear glossy lip. If I had taken more time to look at the colors in person I would have picked a few of the brighter or deeper shades, but I did want to pick a few safe shades to test the formula. Out of the options I picked I can see myself wearing Flash on a regular basis. Jour and Live are also really pretty. As much as I had high hopes for the classic Boy shade, it kinda makes me look washed out. The Voyage de Chanel Face Palette offers a nice glow to add warmth, color and a little bit of sheen to the complexion. It’s nice for those who want color that’s not overdone. I’ve gotten a little bit of my tan back and found it showed up well on me even with a light hand. I think if I’m a shade deeper it will still show up. You can find the Chanel Rouge Coco Flash at all counters now and Chanel.com. The Voyage de Chanel Travel Palette is available at Chanel.com. Have you tried the new Rouge Coco Flash or new launches from Chanel? What did you think? Rouge Coco Flash purchased by me. Voyage de Chanel gifted by Chanel. For the face the cheek colors are all about light and luminous kind of shades. The Poudre Lumiere in White Opal is a duo chrome pink violet highlighter. As with the other Poudre Lumieres it is on the intense side of shimmer for Chanel. There are a lot of other similar shades from MAC and Anastasia that have a similar effect, but this is the first duo chrome pink-violet highlighter I’ve felt I can wear without looking like a disco ball. The Les Tissages Blush Duo Tweed Effect in Tweed Beige has an overspray of gold shimmer. Underneath I still find a relatively shimmery blush, it has a lot more shimmer compared to other Tweed Blushes. On me it pulls more like a luminous blush on the verge of highlighter material versus a blush. I still think it’s gorgeous – on my skintone right now it’s like a flesh toned highlight. Both items have excellent coverage and smooth application. Lasting power is very good on the skin. I gravitated towards the warmer options. The Lueurs Ambrees is a super easy to wear kind of quad. It has all the shades you need for a complete look. Finish/formula is different from their other Les 4 Ombres. It has a softer almost creamier touch for the metallic colors. The matte is soft and flawless with decent medium-sheer coverage for a light matte. I tried the quad alone and also layered on top of the Cream Shadow in Gemme Doree and both application methods work. The Ombre Premiere in Gemme Dore is a sheer but buildable cream shadow. Once it sets it will not budge and has seriously good lasting power. I like that it has shimmer which makes it easier to blend and is more forgiving on my eyes once it dries. I can’t usually wear matte creams – once they dry they make my lids look dried out and wrinkly. The Pierre de Rose Ombre Premiere surprised me in a good way. I typically avoid baby pinks as they don’t look good on my complexion but this was a really easy to wear fresh pink shimmer. The Les 4 Ombres quad Cristal de Printemps has good pigment and applies well – the light colors are too similar to create contrast on my eyes. On my skin tone they end up looking the same. For the lips I have three of the four options in the collection in Cornaline, Bois Rose and Corail Intense. I’ve hated the Rouge Allure Ink in every single color I’ve tried and I now realize it’s most likely just the light neutrals that have poor coverage on my pigmented lips. Cornaline is a bold orange and has the perfect even coverage I expected from the neutrals like Serenity and Lost. 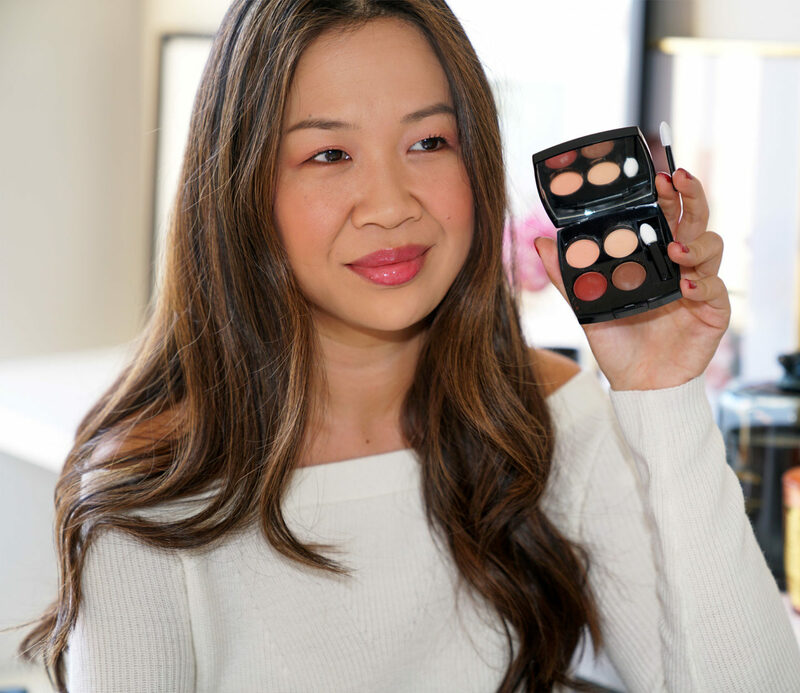 I know many of you love this formula and based on my experience with this newer color, I suspect that the darker shades are going to be worth a second look for me. Lasting power with this one is pretty good, but it’s not transfer proof. There are two new Le Rouge Crayon de Couleur in Bois Rose (perfect neutral rose) and Corail Intense (bright coral). Both have a glossy finish with medium to full coverage. These are twist up crayons so once you start using them the tip will lose its pointy shape and flatten out. Many of you have mentioned that’s a deal breaker for you. It hasn’t bothered me but I do see how having a pointy or angled tip makes application easier for a pencil. Since the formula is so emollient and glossy it will fade faster than a regular lipstick, but it’s comfortable on the lips and I don’t mind reapplying. The four items I was most excited about were the new Le Vernis colors. A few sides by sides next to a few other Chanel shades. The new ones have a similar vibe to previous launches. Overall pretty and soft for spring. Colors are easy to wear and nice for a fresh faced look. My favorites are the Lueurs Ambrees Quad, White Opal highlighter and Bois Rose Lip Crayon. For the nails I find myself really obsessed with Jaspe even though it’s really close to most of the other orange/corals I own. Have you checked out anything from the collection yet? What did you think? You can find the Chanel Pierres de Lumiere Collection out now at Chanel.com. Chanel products provided courtesy of Chanel for review. Chanel launched three Le Voyage Travel Skincare Sets on Cyber Monday and they’re still available for a limited time. For the first time I can remember Chanel has launched miniatures in skincare sets! Most of the time they are full sizes for makeup, fragrance and skincare in the US. I do think there are more options available internationally but in the US we don’t always have access to all the launches. I have a look at the Hydra Beauty Le Voyage Set which retails for $120. Online they also have a Le Lift Le Voyage for $185 and a Sublimage Le Voyage for $425. In addition since so many have asked I’ve included my Top 10 Chanel favorites at the end. Hydra Beauty Micro Serum (15 ml/0.5 fl oz) is one of the prettiest lightweight serums I’ve tried, I used this years ago (when I still lived in San Diego), it has product encapsulated in micro droplets and are released upon application. It’s lighweight but helps your moisturizer to absorb better. Hydra Beauty Creme (20 g/0.7 oz) comes in a super cute black mini compact. It has a seal inside to protect the product and prevent it from drying out and also has a mini spatula. This is so cute and has genius packaging. I’m keeping this and going to refill it when the creme is used up. I have not tried the cream before but did test it over the past week. It’s smooth and has a very lightweight feel. Gentle Biphase Eye Makeup Remover (30 ml/1 fl oz) is too cute for words. This has been one of my favorite eye makeup removers, it doesn’t work the best on waterproof formulas, but for regular ones it is a staple. I hope you found this roundup helpful! The sets are really cute and nice for travel. You can find the Hydra Beauty Le Voyage Set for a limited time at Chanel.com. My top 10 picks also available at Chanel and Nordstrom along with many other beauty retailers. Le Voyage Set provided for review. Additional press samples featured have a * next to them. This holiday season Chanel has launched their classic No. 5 Eau de Parfum ($160 for 3.4 fl oz/ 100 ml) and No. 5 L’Eau ($160 for 3.4 fl oz/ 100 ml) in limited-edition red bottles. Right now Chanel.com has the early exclusive until November 1, 2018. It will be available online and at select boutiques from November 2, 2018 to December 31, 2018. I’ve been a fan of the L’eau version for a light powdery floral. It had been a long time since I tested the original No. 5 Chanel and was thrilled for a chance to try it from Chanel. The bottle is a deep red in the classic glass shape. Depending on how much light hits the bottle you’ll see different intensities of red color and I think it’s just beautiful! Wearing Rouge Puissant on the nails. I think most of you are familiar with this scent, it’s a classic! I smell rose, jasmin and a hint of powdery florals mixed in. They list vanilla as one of the notes but I cannot detect it. It’s ultra feminine and has very long lasting power. By comparison the No 5 L’Eau is lighter, brighter and does not last as long, with perfumes it’s something I don’t mind as I love to reapply, I often keep minis on hand with me. It’s a classic for sure. Floral, feminine and has a soft powdery feel. If you like the L’Eau version better it also comes in the limited-edition red bottle for the holiday season. The Chanel No 5 and No 5 L’Eau are available exclusively at CHANEL.com from now until November 1, 2018. Available online and at select boutiques from November 2, 2018 to December 31, 2018. Retail price for each is $160 for 3.4 fl oz/ 100 ml. In the post I’m also wearing Le Vernis in Rouge Puissant (reviewed here) and Rouge Allure Velvet Extreme in #116 Extreme (swatched here). Have you tried this one before? What’s your classic perfume scent? I always love reading about your favorites, let me know in the comments. Perfume provided courtesy of Chanel for review. I’ve been a little absent on the blog and Instagram catching up on some things at home, doing some de-cluttering and also fixing up things at our house. I have a lot to share with you in beauty this week and today I have a review of the three Chanel Hand Creams that have launched over the past year. Chanel launched their first version La Creme Main Hand Cream last year in the cutest egg shaped packaging I’ve ever seen. The second launch was in a scented version called the On Hand Cream in the No 5 L’Eau which is a soft powdery version of the perfume. Most recently this fall Chanel released yet another formula called La Creme Main Texture Riche which is supposed to be a deeper richer texture that offers eight hours of hydration. I have thoughts on all three for you today. All of them are packaged the same way in a white squeeze tube shaped like an egg. The cap is removeable and I’m really happy to report it always clicks back on even when in a handbag. They run at $50 each for 1.7 fl oz/40 ml, made in France. I reviewed the original La Creme Main when it launched last year and still love it to this day. It’s hit or miss for some. I like it because it has a velvety dry down without any sticky or emollient residue. It smells like a soft sweet floral with a clean linen-like feel. It’s formulated to soften, smooth and brighten the hands. One I apply it, I do notice that my hands experience instant relief from dryness and they also look smoother (probably due to the silicone). The overall texture and feel is very lightweight, easy to blend and absorbs fast. If you have extremely dry hands or cuticles you will need something stronger like L’Occitane’s Shea Butter Hand Cream or Kiehl’s Ultimate Strength Hand Salve. Shown above, Le Vernis in Organdi, Le Vernis in Nuvola Rosa, Le Rouge Crayon Discretion, Rouge Coco Gloss in Melted Honey and Bourgeoisie, my kitty is obsessed with the shape as well, whenever he sees it, he guards it like it’s his lol! I have gotten quite a few scratches trying to grab it back. The second version is the No 5 L’Eau On Hand Cream scent which is a soft powdery version of the perfume. I really love the Eau de Toilette but the hand cream has a more powdery feel to it. The scent lingers a long time and is fairly strong for a hand cream. It also offers light moisture with a soft emollient finish like a lightweight lotion. It does dry down nicely but doesn’t quite have the same velvety feel as the others do. Since I wear other perfumes this isn’t one I reach for often unless I’m wearing the Chanel No 5 L’Eau as the hand cream is pretty strong. The newest version is the La Creme Main Texture Riche. This has a noticeably thicker feel than the original and also has more moisture while still having that velvet dry down feel. Chanel reports that this offers eight hours of hydration. I can’t say for sure exactly how long I felt it on the skin, but when I apply it in the morning I don’t feel the need to reapply anything throughout the day. It’s thicker with a product called May Rose Wax so it creates a veil of moisture on the skin that stays put without being heavy. It has a similar scent to the original hand cream which I noticed stayed there for hours. Packed into the cutest little zip pouch I ordered from The Daily Edited (top also shown here). I really love all three. I’m partial to the original version just because it works so well for humid weather conditions, night or day. I keep one by my bed and often one on my desk to apply as needed. It works well at night because there’s no greasy residue so if I touch my pillow or face it doesn’t feel sticky. The scent is pleasant as well so it doesn’t interfere with perfume. Going into the dry winter season I think I’ll really like the Texture Riche. It does make the hands feel softer and has a thicker feel without being too thick. I’m going to start up giveaways again! I’ll be doing one per week either on the blog or Instagram @beautylookbook. This round, one person will receive all three Chanel hand creams. Open internationally but you must be 18 years or older. See terms and conditions in widget for all the details. Runs through Friday October 12th. Winner will be selected within 48 hours after giveaway ends and must respond to e-mail from me within 24 or another person will be selected in their place. To qualify for a chance to win you must complete ALL THE STEPS in the widget. Partial entries will not be considered. Not sponsored or affiliated. You can find the Chanel La Creme Main, La Creme Main Texture Riche at all Chanel retailers. Also available online at Chanel.com. All purchased by me. Have you tried any of these yet? Did they work for you?